Bringhe is the Philippines answer to paella, combining the ingredients to rice. It is also the well known food for the Filipinos. Try this bringhe with raisins so tasty and creamy. 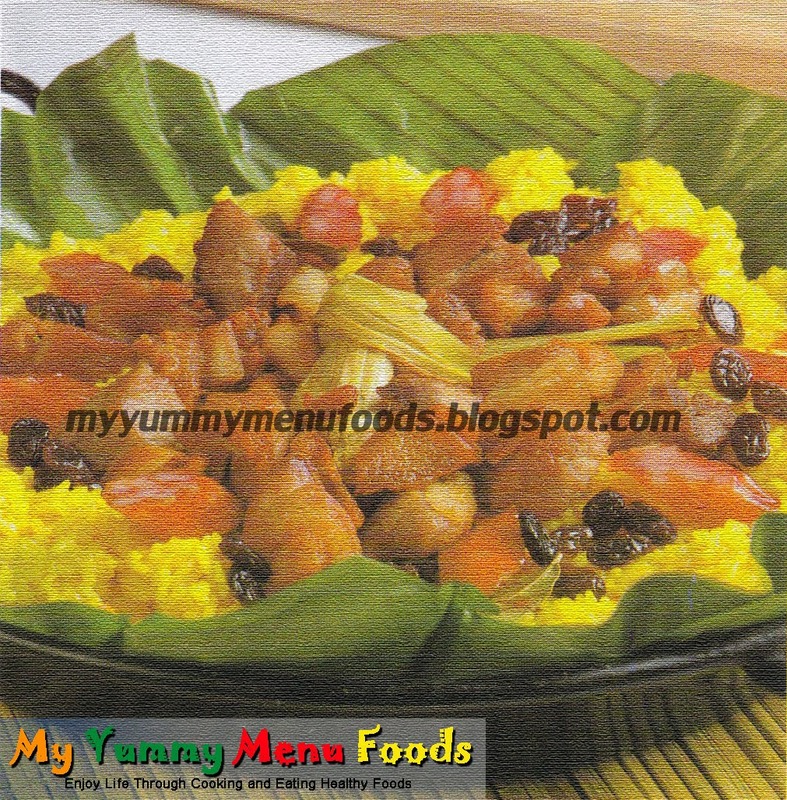 You can prepare this for your special occasions like fiesta, birthdays and other events. 1. Sauté chicken and pork with ½ tsp. garlic and shortening of pork fat. 2. Brown everything gently adobo style. 3. Add vinegar and fish sauce and braise gently. 6. In a deep frying pan, heat oil and sauté the remaining garlic until soft. 7. Add the onions, bay leaf, lemon grass, (glutinous and short grain rice), coconut milk, chicken stock and turmeric. 8. Continue cooking, gently folding the mixture every now and then to prevent sticking until rice is cooked. 9. Add ½ tsp. salt to rice. 10. Line the bottom of another pan with a banana leaf. 11. Pour in the rice mixture and top with chicken and pork adobo, Chinese sausage and California raisins. 12. Cover and simmer 15 minutes. Closely monitor temperature when cooking rice to prevent crusting.